Meat has had a fairly rough ride in recent years. From steaks being blamed for heart disease to bacon’s condemnation by the World Health Organization as a cancer risk, it’s become harder to enjoy a bacon double cheeseburger with a clear conscience. So when the Graphos team met Vientero, a bioscience company with a unique technology to add cooking-resistant probiotics to meats, we were fascinated. Vientero’s concept was exciting. Probiotics have surged in worldwide popularity, especially in yogurt and milk beverages. The list of health benefits continues to grow as more studies are done: everything from improved digestive health to reduced obesity, better mental health, fewer skin conditions, and even lower risk of certain cancers. The proteins in milk whey are a great fit, because they buffer stomach acid, keeping probiotics alive to do their work. But a large percentage of the world’s population is lactose intolerant – 90 percent of Chinese people for example. Meat proteins happen to have the very same buffering properties as milk. And meat producers, needless to say, have been craving a significant health benefit for their products. Trouble is, most meat products need to be cooked – which tends to destroy the really good bacteria along with the kind that spoil food and make people sick. Vientero’s new technology enables its probiotics to survive cooking, even at high temperatures. Because the IP is patent-protected, Vientero decides who is licensed to use it, and can offer exclusivity to brands that have been battling for even the most minor points of product differentiation. As if that were not enough, the probiotics, approved by Health Canada, the CFIA and FDA, through this proprietary technology, increase the shelf life of meat, poultry and seafood products by up to 30%. You can begin to see why this is such an exciting initiative to market. Vientero came to Graphos with a blank slate. We worked closely with the senior leadership team for months, studying the product benefits and evaluating the many challenges and diversity of target markets. We laboured over the nuances of messaging, and how the company’s own look and feel should differ from – and mesh with – that of its first product. Our brand name development team proposed we call the probiotic technology Biacta™. It fits beautifully: we positioned the product as a dual-action probiotic, hence both the “bi” – and the “acta”. It was amazingly precise and compact, yet original enough that we could secure a coveted .com domain and trademark the brand name internationally. We developed complete branding and logo designs for Vientero and its new flagship product, along with Vientero.com and Biacta.com, each a unique web presence perfectly suited to its respective entity. Vientero’s value proposition is nothing short of astonishing, so it was vital to have world class branding and marketing materials to achieve credibility with cynical large-scale players. The messaging had to be spot-on and consistent. The Result: Vientero has been overwhelmed by the initial success of Biacta™. 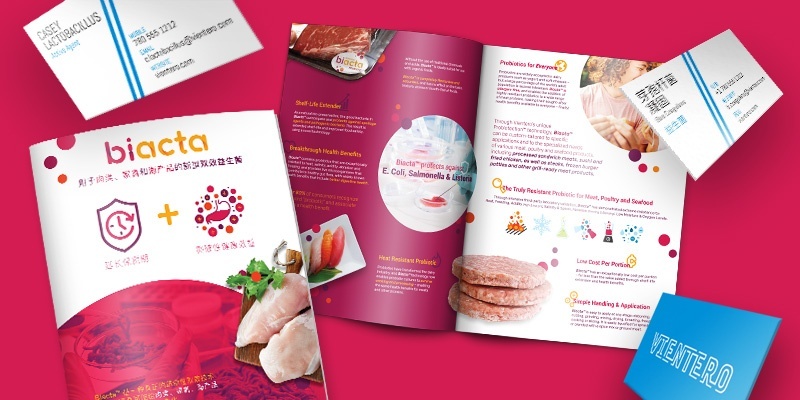 Within weeks of launch, the company had been contacted directly by some of the world’s largest meat processors, grocery chains and QSR restaurants. Now, just a few months in, the company is already busily conducting laboratory and product tests with numerous prospective clients. 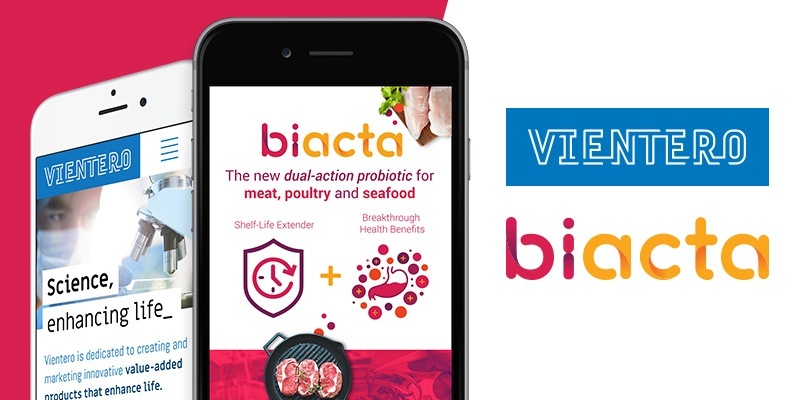 Watch for Biacta™, and get ready to experience the benefits of probiotics with your steak, ham sandwich, chicken caesar. To start getting world-class results with your own marketing, click the button below to download our 26 best tips, tricks and tactics!